Global demand for oilfield equipment will rise 3.8 percent yearly through 2016 to $109 billion. Growth will be strongest in developing areas, where better infrastructure will benefit drilling activity. New, more expensive techniques to drill for unconventional reserves such as shale oil and oil sands will boost spending on oilfield equipment. 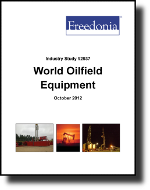 This study analyzes the $90.6 billion world oilfield equipment industry. It presents historical demand data for the years 2001, 2006 and 2011, and forecasts for 2016 and 2021 by product (e.g., drilling equipment, field production machinery, pumps and valves), world region and for 23 major countries. The study also considers market environment factors, details industry structure, evaluates company market share and profiles 26 industry players, including National Oilwell Varco, Schlumberger, and Weatherford International.